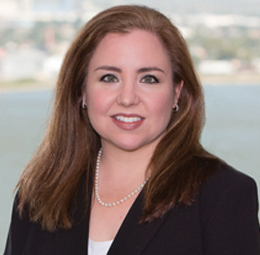 Melanie Breaux's practice consists of a broad range of business, finance and real estate transactions, including real property conveyances, asset acquisitions and divestitures, secured and unsecured lending, and various other commercial transactions. She also has experience in commercial leasing transactions, representing landlords and tenants in negotiating and drafting office building leases, shopping center leases, industrial leases and ground leases. Prior to joining the firm, Ms. Breaux served as a judicial extern for the Hon. Carl J. Barbier. Representation of purchasers and sellers of major office buildings in New Orleans area. Representation of landlords and tenants of commercial property, including office buildings, banking premises, industrial facilities, shopping centers and other retail space. Representation of utility company in multiple syndicated credit facilities and project financings. Representation of regional restaurant franchisee in real estate, leasing and general contract matters. Representation of governmental port entity in development project for recreational park. Representation of gaming company in secured financings. Representation of regional and national recycling companies in asset and real estate acquisitions and leasing matters.